Former Saint Joseph's Hawks head coach Phil Martelli. Two days later and the pain remains. 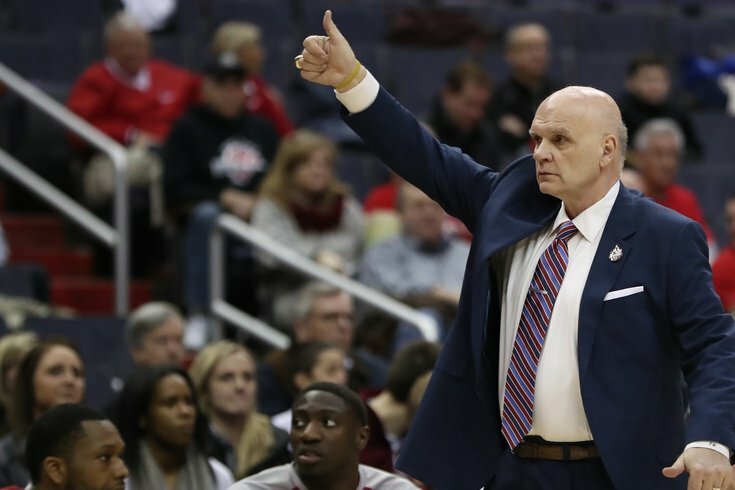 In the passing days and weeks, it won’t get any easier for Phil Martelli. One of the most arduous chores for the longtime, beloved legendary basketball coach of the St. Joseph’s Hawks still remains: Cleaning out his office for the next coach of the Hawks, after Martelli was told the surprising news that he was fired late Monday after 24 years on Hawk Hill. It’s an office — his home away from his Upper Providence, Delaware County home — he occupied for 34 years, filled with joyous and somber memories, and the sweat equity that built the Hawks’ brand and the tiny Catholic school on 54th and City Line Avenue to national acclaim. Martelli, who will be 65 in August, has received a deluge of calls and text messages from friends, coaching colleagues from across the nation, including Villanova’s Jay Wright, Duke’s Mike Krzyzewski and former Temple coach Fran Dunphy, his lifelong best friend, his multitude of friends, his mass of former players and the countless people he’s touched through the years with his association at St. Joe’s and the Philadelphia Coaches vs. Cancer organization. For those that know him, Martelli is a salt-of-the-earth guy who speaks his mind, possesses a keen, quick wit and that rare mixed acumen of street and book smarts. In many ways, he’s an anachronism of the 1950’s, a hoops hustler who would beat you in a one-on-one game for a few bucks, and if he heard you were hurting in some way, he’d take the shirt off his back to help. Martelli has received over a thousand messages from people that know him passing along their regret — and as is typical with Martelli, he’s trying to get back to every one of them. Though he hasn’t left his house since arriving back from St. Joe’s on Tuesday, the outpouring of gratitude hasn’t gone unnoticed by Martelli, including the huge billboards on I-95, 322 and the Schuylkill Expressway that spell out in big, bold white letters on a St. Joe’s maroon backdrop: THANK YOU COACH PHIL! He’s cried and had to put the phone down numerous times over the last couple of days. “The truth is there’s still tremendous pain and tremendous numbness, and it’s tripled by the fact that my family has to go through this,” Martelli said in an exclusive phone conversation with PhillyVoice.com Wednesday night. “I’ve been in my basement since 7:30 (Wednesday morning) and I haven’t stopped answering or calling, or thanking everyone that’s responded— and I haven’t even checked my email yet. “The calls, the billboards, it all takes my breath away. It’s all been great from everyone. But the ones that have touched me the most are getting calls from a kid I coached at Bishop Kenrick in 1982 and calls from parents of kids that I didn’t get. That’s what gets to me. I don’t anyone knows how impactful a simple word is. In a letter to the St. Joseph’s community, new St. Joe’s Athletic Director Jill Bodensteiner said the decision to replace Martelli as head coach came following a comprehensive review of the men's basketball program. “The decision was not an easy one, but I believe it is the right one — for both the men's basketball program and the institution as a whole. Coach Phil Martelli stands out among his peers in college basketball not only for his long tenure and the many accolades that he and his team have achieved, but also for his engagement with the community and his service as a wonderful ambassador for SJU. When PhillyVoice reached out to contact Bodensteiner Thursday morning, a school representative responded that Bodensteiner would not be available to answer any questions on Thursday about the Martelli firing. As of Wednesday night, Martelli said he still hasn’t read the statement that St. Joe’s released. “To their credit, (St. Joe’s) called me and asked me if I wanted to see it, but I declined,” admitted Martelli, who told his team 7 a.m. Tuesday in the team’s video that he was being fired. “I still haven’t seen it. The only statement that mattered to me was what was stated in the (school’s) president’s office on Monday. It was done in person. “Coaching St. Joe’s basketball was a way of life for my family and me. As I move away, I’m starting to realize it was a job, but I never treated it like a job. I treated it as a way of life. I don’t feel that I was naïve. I don’t feel like I was fooled. But I lost my way of life when I lost my job on Monday. In 24 years, Martelli went 444-328 at St. Joe’s and took the Hawks to seven NCAA Tournaments, including the Elite Eight in 2003-04, when the Hawks went 30-2 and started the season 27-0 with an Atlantic 10 Conference record of 16-0 in the regular season, before losing to Xavier in the A-10 tournament. The Hawks, who ranked No. 1 in Week 16 of the regular season in both the AP and Coaches’ poll that magical season, eventually lost to Oklahoma State in the East Regional Final. Martelli was named AP College Coach of the Year and Naismith College Coach of the Year. Though the Hawks have been riddled by injuries that last two years, they did finish 28-8 in the 2015-16 season. They beat George Washington, Dayton, and VCU to win the A-10 and then beat Cincinnati in the first round of the NCAA Tournament, their first tourney since 2004. The Hawks lost to Oregon in the second round. The Hawks went 14-19 this past season and finished tied for 10th in the Atlantic 10 at 6-12. “When I wake up tomorrow morning, I’m a fired basketball coach, that’s what I am,” Martelli said. “The overwhelming outpouring that I’ve received has been a balm on a cut. It’s been soothing and I would wish this for everyone, if they were in my position. In the darkest of dark moments, there have been rays of light. Martelli is not going away. He says he still has a burning desire to coach and be on a sideline again. “I’m trying to put things in motion and it’s hard at times, because I have self-doubt since I’m 64,” Martelli said. “I will be around. At this moment in time, I want to be out of the area. I won’t say anything negative about St. Joe’s. I won’t let this change who I am. I want to say at the end that I’m a good person and this won’t change that.